2 1. 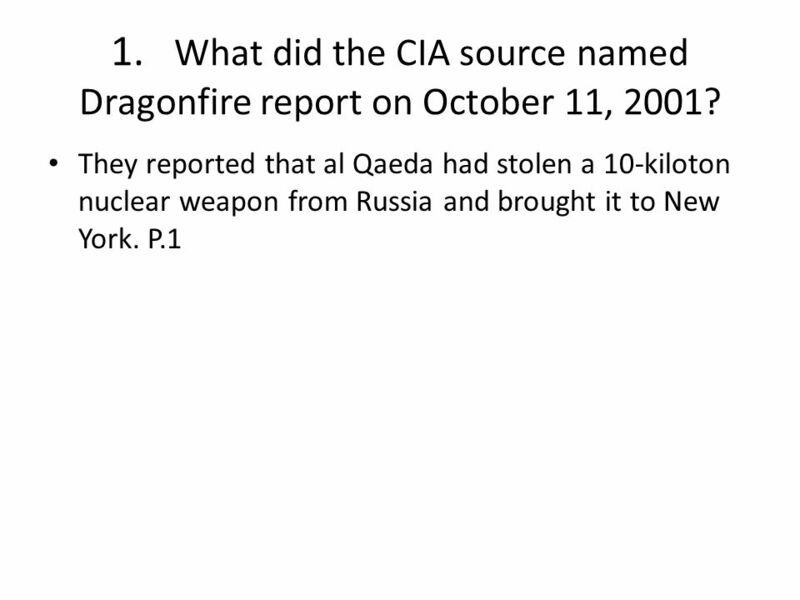 What did the CIA source named Dragonfire report on October 11, 2001? 5 4. 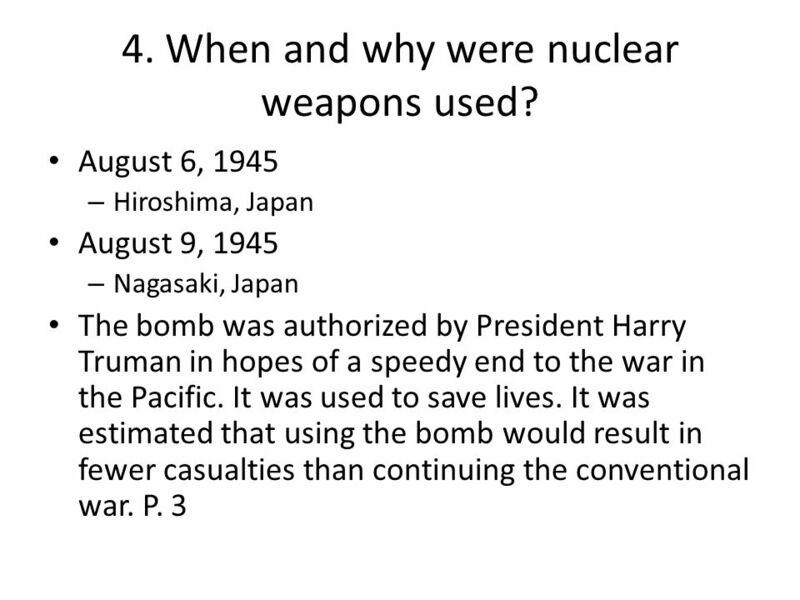 When and why were nuclear weapons used? 6 5. 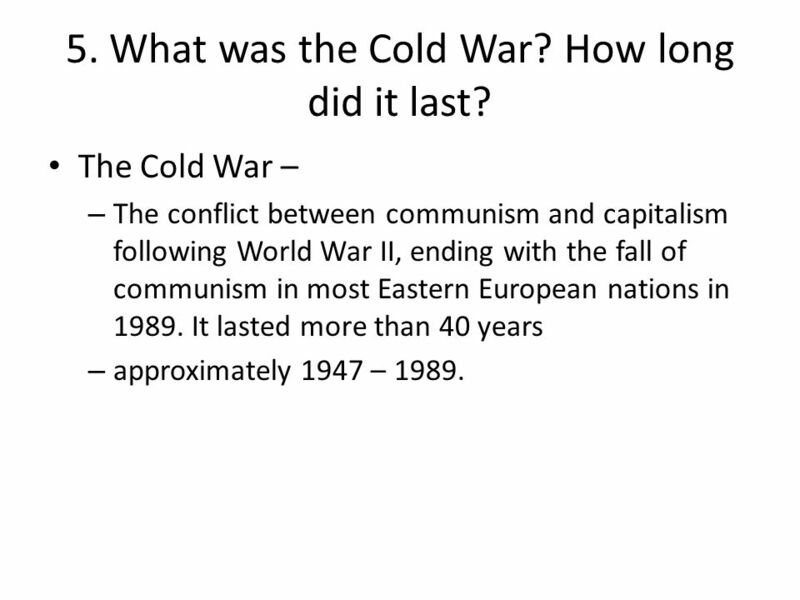 What was the Cold War? How long did it last? The conflict between communism and capitalism following World War II, ending with the fall of communism in most Eastern European nations in It lasted more than 40 years approximately 1947 – 1989. In October 1962 the United States discovered that the Soviets were installing nuclear missile sites on the island of Cuba. President Kennedy demanded the removal of the missiles. 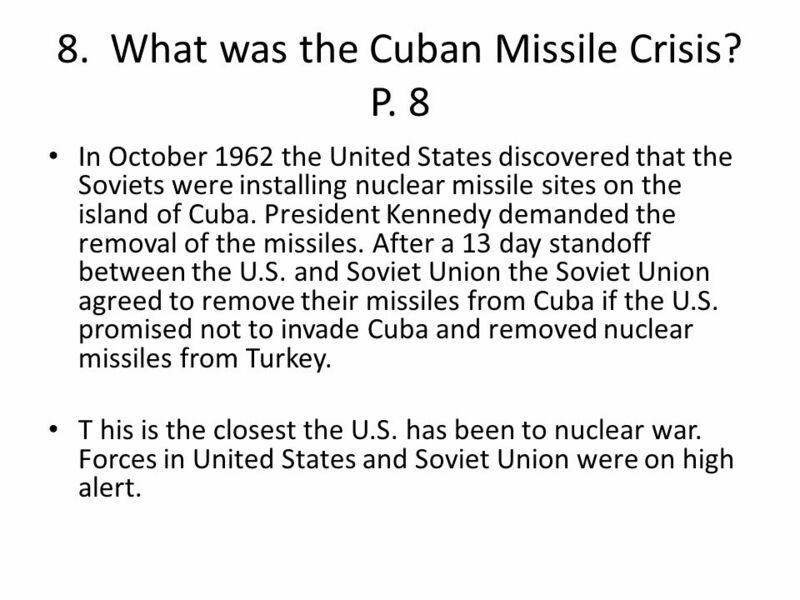 After a 13 day standoff between the U.S. and Soviet Union the Soviet Union agreed to remove their missiles from Cuba if the U.S. promised not to invade Cuba and removed nuclear missiles from Turkey. T his is the closest the U.S. has been to nuclear war. Forces in United States and Soviet Union were on high alert. 9. What was the purpose of arms control? Give two examples of arms control treaties. 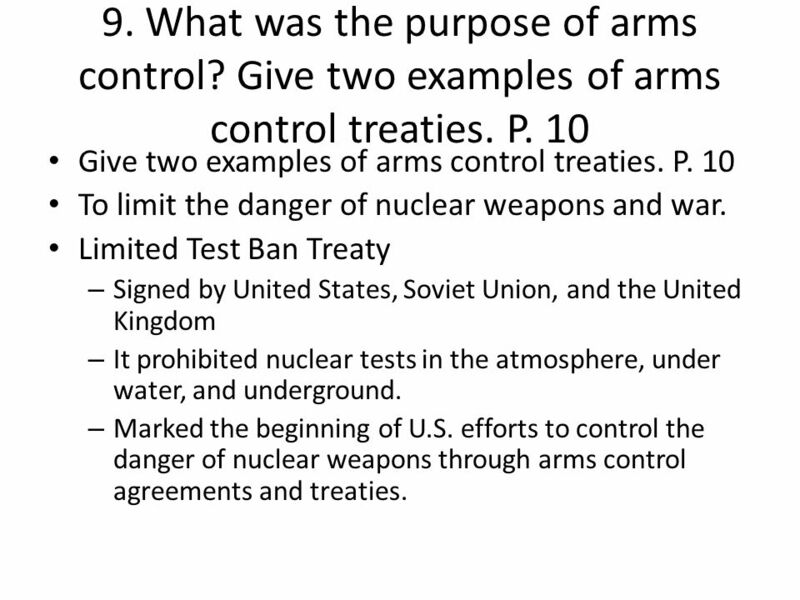 P. 10 Give two examples of arms control treaties. 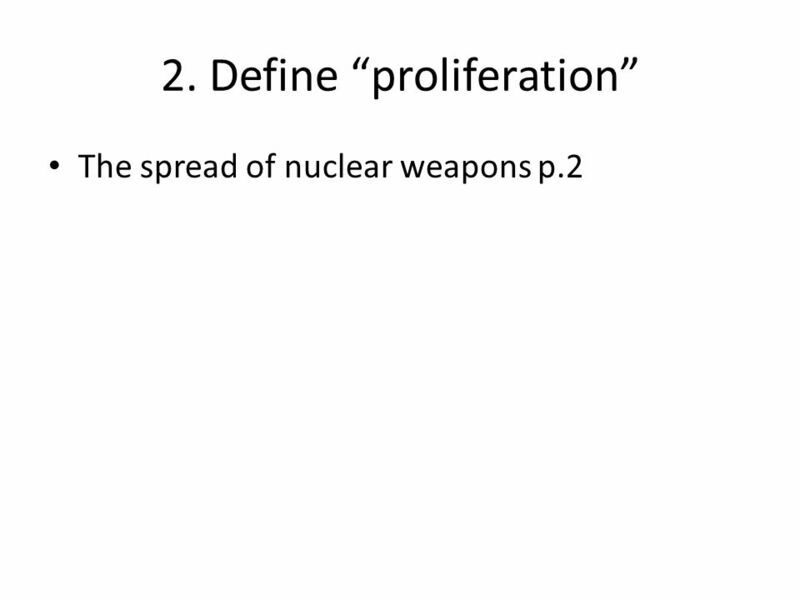 P. 10 To limit the danger of nuclear weapons and war. Limited Test Ban Treaty Signed by United States, Soviet Union, and the United Kingdom It prohibited nuclear tests in the atmosphere, under water, and underground. Marked the beginning of U.S. efforts to control the danger of nuclear weapons through arms control agreements and treaties. U.N. resolution sponsored by Ireland calling for negotiations on an international agreement. 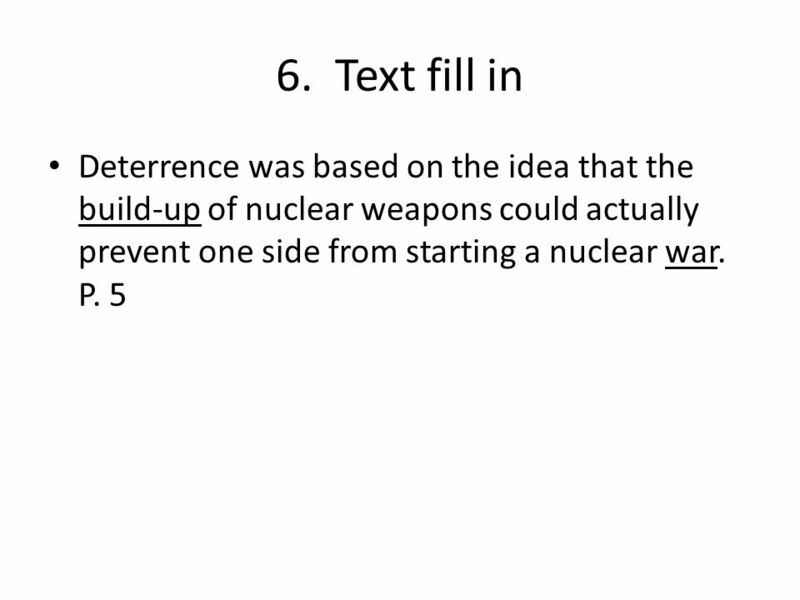 (1961) Prevent state other than those already having nuclear weapons from acquiring nuclear weapons States would be allowed to use nuclear energy for peaceful purposes. The NPT became the cornerstone of U.S. efforts to prevent the spread of nuclear weapons. Ant-Ballistic Missile (ABM) Treaty (1972) Agreement between U.S. and Soviet Union to preserve deterrence. Limited the number of ground based missile interceptors each side could have. 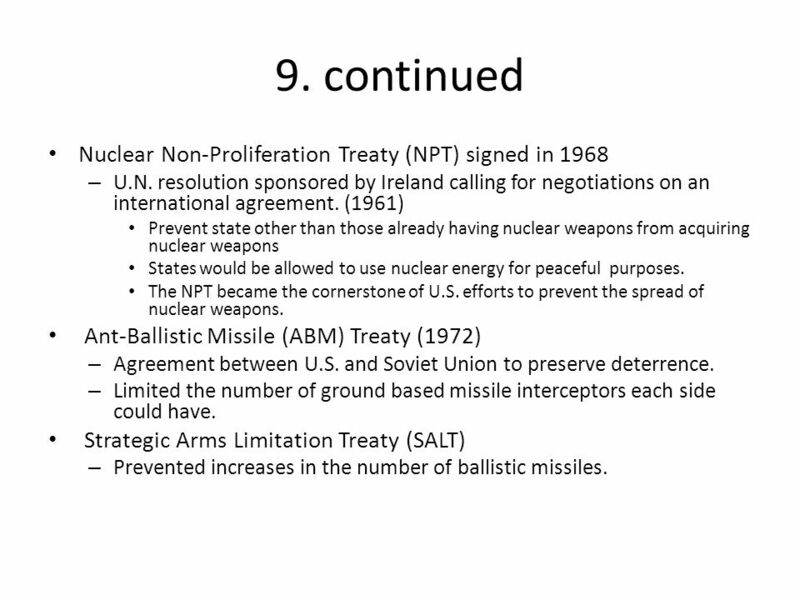 Strategic Arms Limitation Treaty (SALT) Prevented increases in the number of ballistic missiles. 10. Why did President Reagan shift his attitude about the Soviet Union? 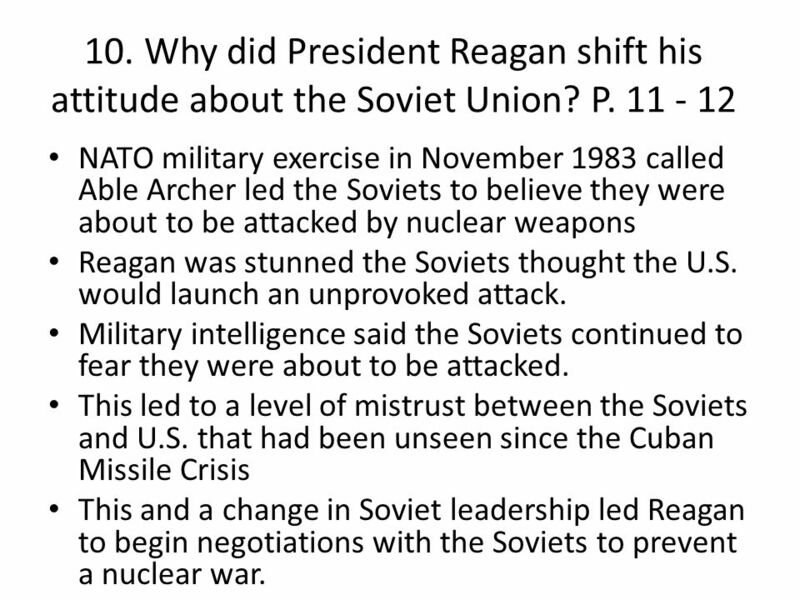 P NATO military exercise in November 1983 called Able Archer led the Soviets to believe they were about to be attacked by nuclear weapons Reagan was stunned the Soviets thought the U.S. would launch an unprovoked attack. Military intelligence said the Soviets continued to fear they were about to be attacked. This led to a level of mistrust between the Soviets and U.S. that had been unseen since the Cuban Missile Crisis This and a change in Soviet leadership led Reagan to begin negotiations with the Soviets to prevent a nuclear war. 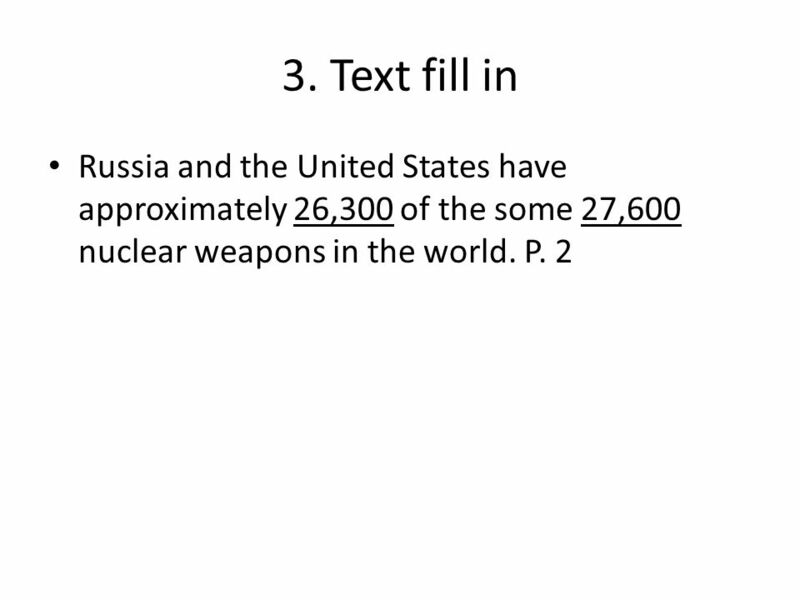 Download ppt "Nuclear Weapons Study Guide 1"
The Cuban Missile Crisis. The United States and Latin America 1823 Monroe Doctrine Monroe Doctrine – The US wishing to prevent any foreign power becoming. TEKS 8C: Calculate percent composition and empirical and molecular formulas. Cold War Tensions. Objectives Understand how two sides faced off in Europe during the Cold War. 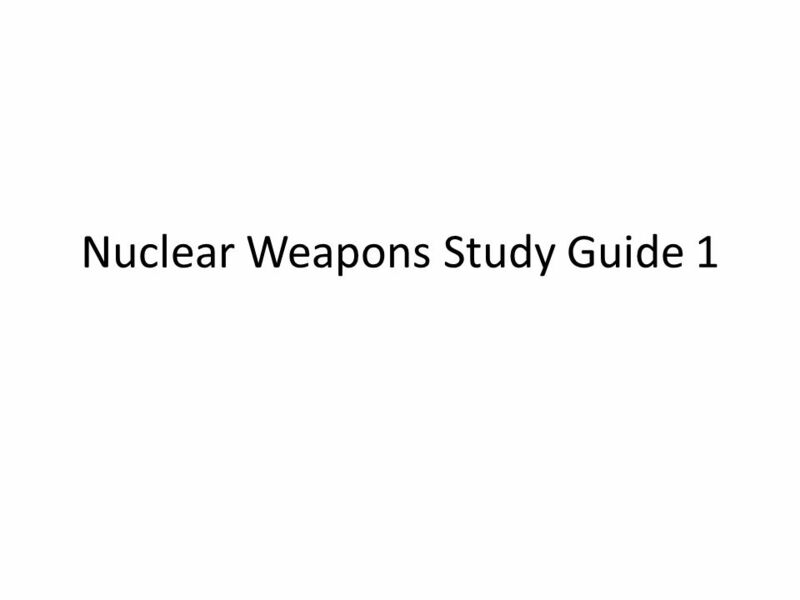 Learn how nuclear weapons threatened the world. 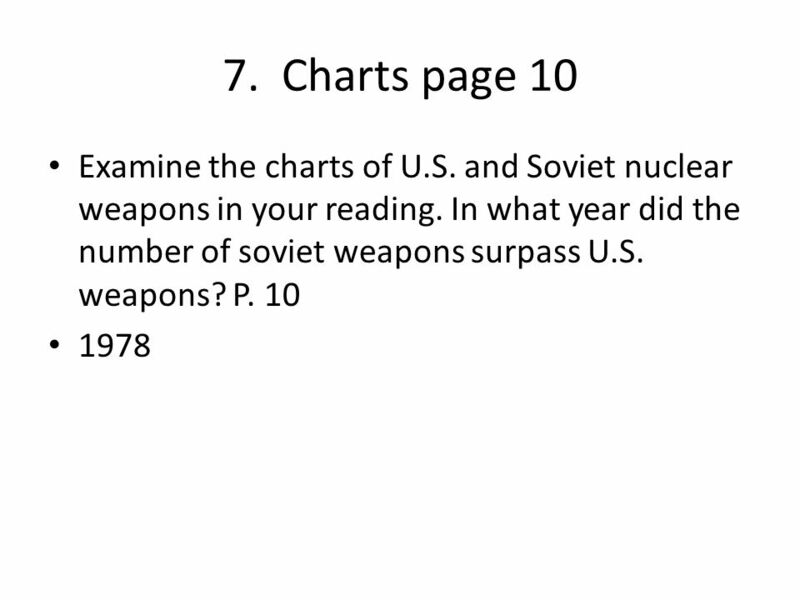 Understand how the Cold War. Kennedy’s Foreign Policy Terms and People John F. Kennedy – a Democratic senator who was elected President in 1960 Richard M. Nixon – former Republican. Objectives Explain the steps Kennedy took to change American foreign policy. Analyze the causes and effects of the Bay of Pigs invasion and the Cuban Missile. The Cuban Missile Crisis Pgs John F. Kennedy John F. Kennedy (JFK) became President in He was 43 – making him the youngest person ever. Nuclear Arms Race! By Adam Damon and Grant Patrizio. The Cold War: “Super” Collision 1960s, 1970s & 1980s U.S. versus U.S.S.R.
Regents Review The Cold War. Cold War A competition or a rivalry between Communism (USSR) and Democracy (U.S.). A competition or a rivalry between Communism.